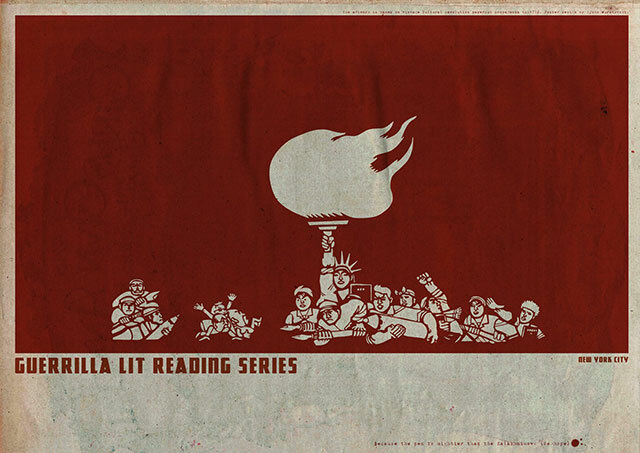 We’re called the Guerrilla Lit Reading Series. And we’ll let our tagline speak to the significance of our name: Because the pen is mightier than the Kalashnikov (we hope). ‘Taking over New York City’ is a design work commissioned by the Guerrilla Lit Reading Series. The illustration for the poster is based on a vintage Cultural Revolution papercut propaganda collection from the late 1960s China. The original work, which can be found in the collection at the Center for Chinese Studies at the University of Michigan, is painstakingly cut out of red paper in the tradition of the age-old Chinese handicraft. The papercut shows rallying writers and journalists threatening to stab feudal capitalists with giant fountain pens that look like spears. ‘Taking over New York City’ draws strongly on this theme and the symbolic reference is appropriate, considering the name of the client. While this is a provocative poster, it is not political in nature. The work is a visual commentary inspired by the new social realities in the United States and the recent protests in New York City instigated by the economic crisis. By juxtaposing Chinese propaganda with a New York theme (note the ‘revolutionised’ Statue of Liberty in the image), the poster draws a parallel between the two events – the Cultural Revolution and the ‘Occupy Wall Street’ movement. Another interesting detail here is that this work is planned to be screen-printed on the back of other posters that have been ripped off a wall. This so-called ‘guerrilla semiotics’ or ‘culture jamming’ denotes a tactic that is often used by many anti-consumerist social movements in their effort to disrupt and subvert the corporatisation of the society. Therefore, this poster should be seen as a form of ‘subvertising’. The series was founded in 2007 by four recent graduates of the New School’s MFA program: Marco Rafalá, Reinhardt Suarez, Lee Matthew Goldberg, and Dani Grammerstorf. Sadly, Reinhardt and Dani both moved out of the city. Today, the series is still run by founding co-curators Marco and Lee, along with new co-curators Nicole Audrey Spector and Camellia Phillips. We feature fiction, poetry, and nonfiction. We have no genre limitations or preferences. Literary fiction, science fiction, memoir, thrillers, young adult — we host them all. We generally host three readers at each event. Our aim is casual, as if the audience has gathered around the campfire together to hear great stories. We started at Bar on A in the East Village and were there for many years until it closed (it’s a 7-11 now). We then moved the series to Jimmy’s No. 43, also in the East Village. Now, as of September 30, 2015, we’re thrilled that our new home will be at Dixon Place on the Lower East Side. Traditionally, we’ve held the series the last Wednesday of every month. Going forward, we’re probably moving to a more seasonal format — so stay tuned. We’ve been continuously active since 2007. Both! Whenever possible, we like to pair emerging writers with more established authors at each reading. We encourage emerging writers — whether they’ve just published their first novel, short story, or chapbook or are still in the drafting and submission process — to contact us directly at guerrilla.lit@gmail.com. Our founding goal was to maintain and foster the sense of community we had in the New School writing program — and that is still the case. We love all kinds of stories — no matter the form or focus. If you can tell a great tale in verse or prose or accompanied by guitar (which we’ve done before when Don Bajema read to music by Pete Sinjin), we want you on our stage. We see our series as a complement to the wider community of readings and literary events around the city. The next Guerrilla Lit is scheduled for Wednesday, September 30th, 2015 at Dixon Place between Rivington and Delancey and will feature Lev Grossman, Frederic Tuten, and Will Chancellor.